Personal Media Corporation has been aggressively supported the TRON project, an open development platform for embedded systems. We offer assistance in every phase of your product development, from development focusing on the real-time OS "PMC T-Kernel" to technical support, and from sales to publication, through various solutions. We provide One-Stop Service for T-Kernel, utilizing our advanced technologies and experiences gained from the involvement in TRON projects' history, and the close partnership with business partners. 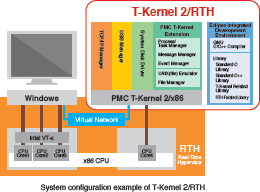 We offer porting of our T-Kernel related software to the CPU or hardware designated by customers. ARM7, ARM9, ARM11, Cortex-M3, Cortex-A7, Cortex-A8, etc. MIPS, PowerPC, SH, V850, Nios, etc. We can port the software to the other CPUs not listed in the above. We provide you with porting or developing device drivers, middleware, and applications that support T-Kernel. 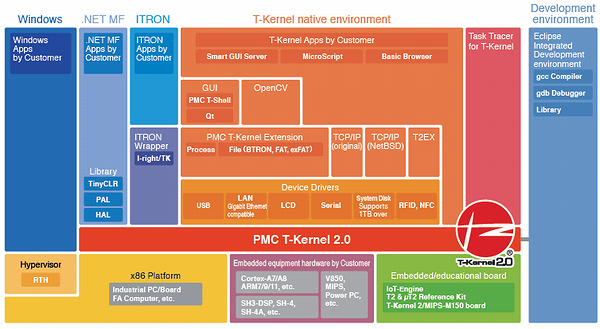 "I-right®/TK"(ITRON Wrapper for T-Kernel) enables a lot of your developed ITRON programs for embedded systems to work with the device drivers and middleware for T-Kernel. This kit is the high-performance and high-functioning embedded board with μT-Kernel 2.0 and T-Kernel 2.0. This kit also includes various middleware and device drivers for T-Kernel, development environment, technical documents. Teamacaron is the minimal computer for embedded control. By this computer, you can develop embedded devices in a short period of time, which balance embedded real-time control with advanced information processing. IoT-Engine standard board with low-power consumption Microprocessor and μT-Kernel 2.0. Products bearing the mark is a RoHS Directive compliant product. All books and magazines listed below are described in Japanese, published by Personal Media Corporation. Their prices do not include tax. English Specifications are included as PDF files on CD-ROM. Please feel free to contact us with any questions about our T-Kernel related products. © 2007-2018 Personal Media Corp.